Decayed or chipped teeth can often be repaired with white composite fillings that look natural, however if the damage is too substantial, particularly on the back teeth, then an inlay or onlay would be recommended. 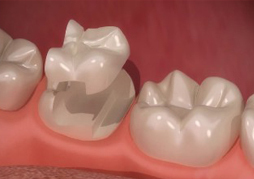 Inlays or onlays can be made from a number of strong materials such as metals or ceramics. After an impression is made of your tooth, the inlay or onlay will be made in a dental laboratory by a technician. While these are being made, you will wear a temporary filling. 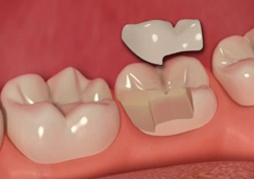 When your inlay or onlay is ready we will bond it into place using a special adhesive, after removing the temporary filling. Your restored tooth will not only look like a real tooth but also function like one, allowing you to bite, chew and eat without any discomfort. Thanks to advances in digital technology (called CAD/CAM) porcelain inlays can be made at some dental practices using a special milling machine known as CEREC. This means you will need fewer visits to the dentist to have your tooth restored. Long-term aesthetic and functional solution.